Courage in LIFE – continued…. In the shadow of Veterans’ Day, we look toward and remember the sacrifices of men and women throughout history whom protected the innocent with their lives and sacred honor. You will see courage come through the story of Master Sergeant Benavidez which I retold recently or the above picture of the troops storming Normandy. But it is greatly needed today on the battlefield of the American mind and heart! Bill Lewis, co-founder of LIFE, published a blog about the state of integrity and courage in today’s news. It is a must read for all Americans. Follow his link on the right of this page to ‘What has happened to America’s character‘. It brings the value of courage and fear face-to-face with reality. I compel you, also, to listen to LLR 509 – The Churchill Factor by Kirk Birtles, because Kirk expresses how to overcome the issues in war for the minds of men. I will allow you to hear it for yourself, but he talks about it in a conversation with Orrin Woodward about the fear of man. Orrin had told Kirk that he fears no man. If only North American men could develop the thoughts Orrin expressed to Kirk and back them through Christian foundations, where would we be? Men should look to protect the innocent and expose the wrongs. The leadership fell apart on a university campus secondary to a lack of courage to do what is right. I recently heard a pastor speak on this issue of courage. He gave four points to improving our courage. 1) Courage is Purpose Driven. If asked of your purpose, how would you answer? Would you state it boldly and it is seen in your eyes as truth? Are you taking each step with specific intent? As a Christian man or woman, do you use every moment to glorify God? Life is all about the line between your purpose-filled goal and where you are right now. We each have the ability to control distractions that make curves in the line. 2) Courage is Persistent. “In this you greatly rejoice, even though now for a little while, if necessary, you have been distressed by various trials” I Peter 1:6. Do you stop at trials? Is it a ‘no matter what’ or is it a ‘if only’? Can you be called ‘tenacious’? We will make endurance our ally. I would encourage each of you to listen to ‘Rascal‘ by Chris Brady. It can be found attached to the back cover of Brady’s book with the same title. 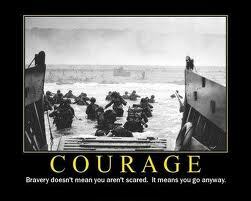 3) Courage is Prepared to Die or Live. There is joy in serving. Not just jumping on the hand grenade for your comrades, but living a life of example for them. We should be always doing our homework: listening to experience through seminars or CD’s and challenging our assumptions through books. Working out mentally and physically for our time when it arrives. 4) Courage is Pervasively Contagious. You are the best motivation for your family, team, or associates. Compel people to be courageous and integrity-filled through your actions. It is said that true leadership is found in the front. As you proceed forward, others will follow. Bill Lewis took the time to share his heart on the current issues plaguing character. But what is even more powerful is Bill’s courageous walk in LIFE and modeling the correct behaviors in all of his 8 F’s. He knows we can change our expected future only with courage. Thanks, Bill! Another great post, Aron! Your courage has been proven time and time again. I’m proud to serve with you in this journey.